A lack of speech privacy is not a unique problem, but with the increasingly stringent regulation of private information, it cannot be ignored. Whether speech privacy is required in a hospital, lawyer's office or green star rated open plan office, Soundmask's systems have been tried and tested to meet the challenge. Healthcare and hospital staff discuss private health information with patients and between each other in the course of their duties. While procedures are usually in place to keep written information relating to patients confidential, in verbal communications, health privacy laws can be overlooked. It is precisely in situations where such communications are audible that speech privacy is paramount. Installing a Soundmask system can ensure that healthcare professionals comply with HIPAA and other health privacy legislation. Many professionals, like lawyers, are legally or ethically required to maintain client confidentiality. Verbal communications within rooms where private personal or business matters are discussed should not be audible to eavesdroppers or passers by. Failing to ensure speech privacy can undermine client confidence and possibly result in a breach of statutory or fiduciary duties relating to privacy. However, these problems can be easily solved with the installation of a Soundmask system either throughout the office or in isolated problem areas. Due to their open design, open plan offices generally have no speech privacy. While it is desirable for open plan offices to promote open communication between colleagues, there are instances where a lack of speech privacy is problematic. For example, if team leaders or managers share office space with their team, holding private telephone conversations with off site team members or between themselves will be overheard. Similarly, support staff recording and confirming confidential client details may be overheard by intentional or unintentional eavesdroppers who are not supposed to be privy to the information. Installing a Soundmask system throughout the open plan office space is an effective and low cost solution. In green buildings, the noise of a traditional HVAC (heating, ventilation and air conditioning) unit is replaced by the quiet of natural ventilation and radiant cooling. A lack of speech privacy is suddenly a bigger problem because of the low internal noise level, but can be solved by adding Soundmask's non-intrusive wash of background sound. 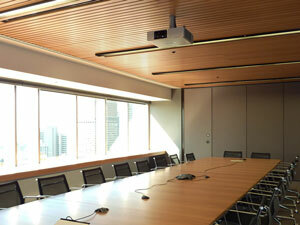 Surrounded by meeting rooms and the reception area, the boardroom at United Super's head office required speech privacy. Prior to the installation of a Soundmask system, meetings were audible between rooms. Southport Anaesthetic Specialists needed to fix issues with speech privacy in the reception due to the health privacy legislation. 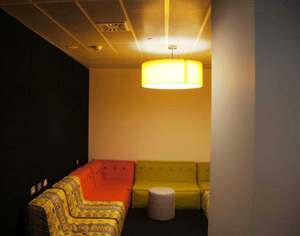 Speech privacy is required in meeting rooms, like at the Commonwealth Bank headquarters, where confidential communications take place.